Smart technology can only be as smart as the people who use it, otherwise it only ends up as another fancy gadget in the house! As S Vishwanath, a water expert says, Smart cities is the mantra of our times with a 100 slated to roll out in India. Ideological debates rage over how to define ‘smart’ and whether technology is what makes for ‘smart.’ Barring the debate, a peculiar way though would be to say that smart people make smart cities. And technology can indeed play an important role to aid people in making ‘smart’ informed decisions, especially about responsible water use. How can technology help us in making informed decisions? Source water meters– Source metering i.e. metering all your borewell supplying water to your house and ensure readings are recorded daily is essential. This will help keep track of how much water is pumped and how much water one is using and correlating this information with consumption meters will help identify the leakages in distribution (if any). Consumer meters- This is very important to keep track of who is using how much water. 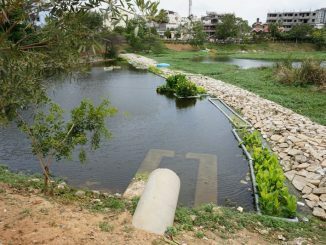 Given the fact that many cities including Bangalore are facing severe water crisis, curbing demand to reduce pressure on the source of supply and demand management becomes really important. Automatic water level logger– In the earlier times, when we were dependent on open wells for sufficing our water needs it was easy to ‘see’ the difference in water levels. But then came the age of borewells, where a small pipe conceals your water or so we think! This is used to measure water level in a continuous monitoring mode, collecting data at user defined intervals and storing the data until it is downloaded in the field by recording pressure and temperature readings. It can help you track the water level change over a period of time. It’ll be interesting to see the correlation between rainfall events and the water level change! A snapshot of installation of this can be viewed here. Groundwater recharge wells: With heavy dependence on groundwater for all water needs, the groundwater levels go down. Therefore, there is a need to recharge the groundwater in balance with the water being extracted. Smaller wells of 3 ft. diameter and 20 ft. depth in different locations like stormwater drains, lowest points in the layout would help in arresting the water and recharging your groundwater. Functioning sewage treatment plant: A sewage treatment plant is good working condition can reduce your load on the potable water supply as treated water can be re-used for flushing, gardening, car washing, etc. It can also help in reducing the cost of fresh water that one pays for. A separate energy meter for the treatment plant can help in making informed decisions about functioning of treatment plant based on energy consumption patterns. Portable water quality meters: Many of us are dependent on borewells for all our water needs including drinking water. There have been reports about groundwater contamination due to sewage percolation. Therefore, testing your drinking water as well as output of sewage treatment plant i.e. treated water becomes equally necessary. The tests are elaborate and one can look at BIS 10500 (2012) standards for drinking water quality and CPCB/KSPCB urban reuse standards for treated water quality. In addition, there are simple portable water quality meters available in the market, which you can use daily to maintain a log and notice changes in the quality daily. This information about devices, their cost and vendors can be accessed from www.urbanlakes.org. Weather station- Weather station can provide information about rainfall, humidity, temperature, wind speed, wind direction. The information about these parameters which when linked with the groundwater recharge can tell a story about decreasing or increasing groundwater table in your area. A simple raingauge like this: Measuring rainfall would also suffice. This list is not exhaustive and of course this is not to say that only technology and infrastructure is needed, but also a conscious decision to responsibly manage water makes a difference. Such initiatives, which can inform about water consumption patterns, recharge patterns, water demand, weather information, water quality, however small they may be, when aggregated at the city level would no doubt help in becoming smart! And like S. Vishwanath says, such a water-literate community is what a smart water city should be all about.